Walking the Berkshires: "Should Old Aquaintance Be Forgot": Who Ever Heard of Thomas Stirling? "Should Old Aquaintance Be Forgot": Who Ever Heard of Thomas Stirling? Perhaps we Americans have a natural disdain for keeping track of our former British adversaries from the colonial era, or maybe there is less interest today in the United Kingdom in preserving the memory of those old defeats. I am otherwise at a loss as to why it is so difficult to find accurate information about a soldier of long service (1747-1801) who fought during the French and Indian War as a Captain in the Black Watch, was severely wounded at the head of his brigade during the American War of Independence, and left the British Army a full general. He doesn't rate a mention in Boatner's (1966) Encyclopedia of the American Revolution, and unless I decide to create an entry you won't find him in Wikipedia. My interest in General Thomas Stirling came about during my research into two battles that took place in New Jersey in June of 1780. He was wounded at the very outset of this campaign - what is often referred to as Knyphausen's Springfield Raid - but there was evidently very little awareness of his ultimate fate on the part of contemporary Americans and subsequent historians. Some sources said the wound was mortal. Others that he died from complications a year later. Given that the Dictionary of National Biography. 63 vols. London, 1885-1901. Vol. LIV, pp. 383-384 declares that Sterling lived another 28 years after his injury, it seems high time that someone set the record straight. Thomas Stirling (1733-1808) was the younger brother of Sir William Stirling, Fourth Knight Baronet of Ardoch, and succeeded to his brother's title as the Fifth (and last) Knight Baronet in 1799. Most available sources agree he was born in 1733. His most complete service record available on line states that Thomas Stirling began his military career with a commission from the Prince or Orange dated October 11, 1747 and spent the next decade with the Scottish Brigade in the service of the Dutch, participating in the final stages of the War of Austrian Succession. On March 24, 1757 (another source says July 24th) he was commissioned a Captain in the 42nd Highland Regiment. One of Stirling's biographical references claims in 1755 he was a captain and lieutenant in the 48th Regiment of Foot and wounded with Braddock at Monongahela, which conflicts with his Dutch service and is not borne out by other available records, including a list of the officers of the 48th. He appears to have been at the Battle of Carillon under Abercrombie and the capture of Ticonderoga the following year with Amherst. He was at the surrender of Montreal in 1760, and wrote to his brother at home that he was "heartily tired of this country, as was every officer in it" and expressing his hope that "Long may Peace reign here...as surely god never intended any war should be carried on by any other besides the natives." It would be a very long time indeed before he would return to his home in Scotland. It gets tricky to follow his movements during this period, as the 42nd had two battalions and the 2nd of these was sent to Martinique in 1759. Captain Stirling and the 42nd (now Royal) Highland regiment was actually sent to the Caribbean in 1762, and he was wounded at Martinique during this campaign and not in 1759 as others assume. The two battalions were combined after the fall of Havana and remained in New York as part of the force selected to protect the colonies. Captain Stirling took part in the relief of Fort Pitt in the summer of 1763 during Pontiac's Rebellion and served against the Ohio Indians in 1764. He is specifically credited with leading a 100 man detachment down the Ohio to take possession of Fort Chartres in southern Illinois. It was an odyssey worthy of the likes of Robert Rogers or Benedict Arnold and I'd love to someday read the journals of the expedition, which reportedly describe such encounters as a "prodigious number" of pelicans that were initially mistaken for a regiment of the white-uniformed French, a personal battle that Captain Stirling had with a "monstrous" bear, and makeshift sails made from the regimental plaids. After overwintering at the Fort, they traveled downriver to New Orleans and sailed via Pensacola to New York and then marched to rejoin their regiment in Philadelphia. "From the moment of their landing, Colonel Stirling was indefatigable in drilling the men to the manner of fighting practiced in the former war with the Indians and French bushmen, which is so well calculated for a close, woody country. Colonel Stirling was well versed in this mode of warfare, and imparted it to the troops, first by training the non-commissioned officers himself, and then superintending the instruction of the soldiers. The highlanders made rapid progress n this discipline, being, in general, excellent marksmen, and requiring only to have their natural impetuosity restrained, which often lead them to disdain fighting in ambush." Thomas Stirling lead his men at Long Island. Coincidentally, the American General William Alexander (1726-1786) of New Jersey, who also happened to be a claimant for the earldom of Stirling, was captured during this battle. Alexander was known to American contemporaries as Lord Stirling even though he was unable to secure the title and should not be confused with the subject of this essay. Lt. Col. Thomas Stirling also took part in the attack and capture of Fort Washington later that fall and served in New Jersey that winter. The battalion companies of the 42nd were in reserve during the Battle of Brandywine and Stirling later led the 42nd and a detachment of the 10th to drive the enemy from Billingspoint ,and so was not present at the Battle of Germantown. He was often sent on foraging expeditions and raids with more than just his regiment under his command. In February 1779 he led a raid from Staten Island to Elizabethtown, New Jersey, and reoccupied Stoney Point when it was abandoned by Anthony Wayne. Clearly, this was a highly competent officer, well suited to service in America. In February of 1779 he was appointed aide-de-camp to the King and. In June, 1780, now a Brigadier General, he lead the first brigade in Knyphausen's invading force that crossed once again from Staten Island to Elizabethtown. At the very outset, it was his misfortune to be shot from his horse in the single volley fired at the British vanguard by a picket of twelve men under Ensign Moses Ogden of Spenser's New Jersey regiment, who had been posted in Elizabethtown by my ancestor Colonel Elias Dayton. Stirling's injury was considered severe and Knyphausen himself took command of the vanguard. But how severe? Thayer's As We Were; The Story of Old Elizabethtown published by the New Jersey Historical Society in 1964 mistakenly states that the wound was mortal. Hatfield's History of Elizabeth, New Jersey (1868) to which Thayer's work owes a substantial debt, reports that the General was unhorsed, and his thigh fractured by the shot, and erroniously claims "he died of his wound, a year later". His injury, while serious, did not prevent him from seeing further service, however. One source states he was at Yorktown with Cornwallis, though it should be pointed out that this source also claims he was with Clinton during his 1780 Charleston, S.C. campaign, which was contemporaneous with his wounding in New Jersey. His old regiment the 42nd Highlanders did go south with Clinton, however. In May of 1782 he was made "colonel" of the 71st Highlanders, succeeded the deceased General Frasier. In 1801 he was a full general. Here then, was the commander of a famous regiment, who saw hard service in the American War of Independence and left North America a Major General, and yet his story is little known and much remains to be clarified. It may be that his loss at the beginning of the 1780 invasion of New Jersey had significant implications for the way that the campaign would develop, and it is a shame his record is not better understood or documented. I was unable to find even a portrait of Thomas Stirling to use in this piece. I am the author of Broadswords and Bayonets which is the history of the expedition commanded by Thomas Sterling to occupy Fort de Chartres and you may be familiar with it. Of course it was publshed in 1984 so some of the information which has now surfaced was not available to me at the time I edited the manuscrips which I saw at the Black Watch HQ at Balousie Castle and at the Scottish Record Office. Thanks so much for your continued interest in Thomas Sterling whose portrait (from Balhousie) hangs on my wall as I write this note to you. Dear Paul; I am delighted by your generosity and all the fine historical details you have shared. I'd be very grateful to be able to use an image of General Stirling, property credited, if you would like to provide one at the e-mail address of this blog. I have Portrait of Maj. Gen. Sir Thomas Stirling from the Black Watch Museum if the list owner will contact me to get it posted. Stirling Younger of Ardoch, Maj. Gen. Thomas. Born Oct. 8, 1731 in St. Petersburg, Russia, Thomas Stirling was the second son to Sir Henry Stirling, 3rd Baronet of Ardoch (Perthshire) and his wife, Anne Gordon (daughter of Admiral Thomas Gordon, a native of Aberdeen, Admiral of the Russian Baltic Squadron and Governor of Cronstadt, Russia.) Adm. Gordon, a former Capt. in the Royal Navy, was engaged in the service of the Czar of Russia in 1717. He was the intermediary between the Emperor of Russia and “The Old Pretender,” James Stuart, who unsuccessfully tried to get the Russians to restore him to the throne by force of arms. In 1737 at about the age of six, Stirling left Russia with his older brother William (later a lieutenant in the Dutch Scots Brigade) and returned to the estate of Ardoch where they were joined by their parents after the death of Adm. Gordon in 1741. Stirling was initially commissioned as an Ensign in the 1st Battalion, Gen. Maj. Marjoribanks’ Regt. 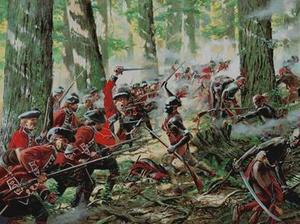 in the Scots Brigade in Dutch service on Sept. 30, 1747 and later placed on half-pay in 1752. He was ordered to active duty again as an Ensign in the 1st Battalion of the same regiment Oct. 31, 1756, but by the summer of 1757 he was in Scotland since promotion in the British Army offered better opportunities. When three additional companies were raised for the 42nd Regt. for the French & Indian War in America, the Duke of Atholl recommended Stirling to the Duke of Argyle for one of the companies. Stirling raised the required number of soldiers and joined the regiment as a Captain in July 1757. Stirling sailed for North America in November 1757, but his transport ship was blown so far off its intended course for New York, it ended up off the island of Antigua in the Caribbean. Accordingly Stirling did not join the regiment in late summer of 1758, thereby missing the bloody Battle of Ticonderoga. He did participate in Amherst’s 1759 expedition against Forts Ticonderoga and Crown Point, and the 1760 campaign against Montreal. He was wounded in the campaign for Martinique in January 1762, but was able to take part in the capture of Havana later that year, where he fell ill with fever and returned to Scotland to recover, not returning until around 1765. In August that year Stirling gained considerable notoriety, when he was ordered to take his company from Fort Pitt in western Pennsylvania down the Ohio River to the Illinois country to accept the transfer of Fort DeChartes from the French. After being relieved several months later by the permanent British garrison, Stirling and his company went down the Mississippi River by boat to New Orleans and Pensacola before catching a ship back to New York and arriving in June 1766 after a trip of over 3000 miles. In 1767, he returned with the regiment for garrison duty in Ireland and became Lieutenant Colonel of the regiment in 1771 in place of Lt. Col. Gordon Graham of Drynie (father of Capt. Charles Graham) who retired. On June 13, 1777, Lt. Col. Stirling received his first Brigade command for the New Jersey campaign “...composed of the 33d and 2 battalions of the 42d.” For the Philadelphia campaign of 1777-1778 the 42nd Regt. was placed in the 3rd British Brigade under Maj. Gen. Charles Grey, but Stirling received a separate command on Sept. 28, 1777 consisting of the 42nd and 10th Regts., which was ordered to seize the rebel fort at Billingsport, New Jersey in order to clear the shipping route to Philadelphia. After returning to New York with the army from Philadelphia and the Battle of Monmouth Courthouse, Stirling commanded a brigade made up of the 15th and 42nd Regiments for Maj. Gen. Grey’s raid on Bedford, Massachusetts in Sept. 1778 and on Sept. 11 commanded a 1200-man detachment, consisting of 150 men from each battalion, (including 300 of the 42nd Regt.) that landed on Martha’s Vineyard to collect stock for the army. In Feb. 1779, Stirling commanded a separate detachment of the 42nd, 33rd Regts. and the Light Companies of the Guards in a raid on Elizabethtown, New Jersey. The rebel New Jersey Journal actually complimented Stirling on this expedition saying: “Colonel Stirling who commanded the detachment shewed himself throughout the whole expedition not only the officer, but the well bred gentlemen...” In May of that year Stirling commanded a brigade consisting of the 42nd Regt. and the 15th Regt. during the raid on Portsmouth, Virginia and led a separate detachment of the 42nd Regt. to Kemp’s Landing, where a number of rebel ships were burnt and a large amount of supplies were captured. Stirling’s brigade assignment changed the next month as General Orders dated at New York on Nov. 18, 1779 directed the 17th, 42d, 44th and 64th Regiments to send returns to Brigade Major Mackenzie at Maj. Gen. Stirling’s quarters. Despite his wound, Stirling was recommended for promotion by Sir Henry Clinton to Major General in America in Dec. 1780 in a letter to Lord George Germain which indicated “The general begs leave to represent the necessity of giving additional rank to the superior officers of the British in order to prevent the German officers of younger dates arriving at higher situations, their promotions being more rapid. He humbly proposes that the major-generals Robertson and Philips be employed as lieutenant-generals and that the brigadiers including Sterling be employed as major-generals...” Accordingly Stirling was promoted to be a Maj. General in America by Orders dated May 27, 1781. (A separate regiment titled “2d 71st Regt.” was formed with some of the officers in America and the recruits in Scotland and Col. Lord Balcarras was made its commander.) Stirling was promoted to Major General “in the Army” on Nov. 26, 1782 and in mid Dec. 1783 Stirling ordered the 71st Regt. 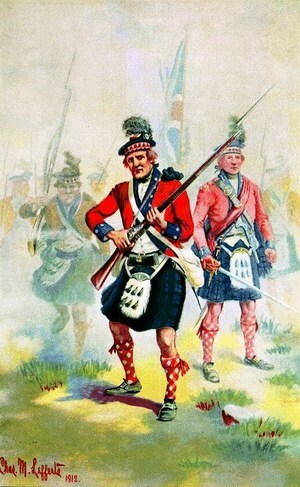 to assemble at Glasgow, and the regiment was reduced in early 1784. Stirling documented his long service in a “Memorandum of Sir Thomas Stirling’s services” which was presented to the Secretary of State for War in 1784 and preserved in the Strowan Charter chest as of 1908. Maj. Gen. Stirling’s military service was not, however, over as he was promoted to Colonel of the 41st Regt. in Ireland on Jan. 13, 1790. The 41st Regt. had previously been an invalids regiment, but it was ordered to “...be discontinued on the establishment as a corps of Invalids from the 25th... [Dec. 1787]...” Stirling served as Colonel of the 41st Regt. for 18 years and, coincidently, was replaced as Colonel by Lt. Gen. Hay Macdowall, former Capt. of the 42nd Regt. In 1794 Stirling bought the estate of Strowan, Perthshire and as “Strowan House” was being built, General Stirling, lived in the house of Lochlane, adjoining his estate. Stirling’s older brother, Sir William Stirling of Ardoch, died on July 26, 1799 and Stirling assumed the title of 5th Baronet of Ardoch. He became a Lt. General May 3, 1796 and General on Jan. 1, 1801. The Edinburgh Annual Register recorded his death in 1808 writing: “May...9. General Sir T. Stirling of Strowan Bart...” Stirling had not married and therefore had no direct heirs. His “trust-disposition” or will dated Aug. 13, 1804, conveyed his estate of Strowan (and lesser estates of Little Cowden” in York County, “Dalginross” in Perthshire, and “Glentarff”) to trustees which general directions to manage it and convey it to Graham of Airth’s “second son.” The trustees were later sued in 1838 by Thomas James Stirling of Strowan concerning the details of the execution of the will. Commissions: Ens. Sept. 30, 1747 (1st Battalion, Gen.-Major Marjoribank’s Regiment Dutch Scots Brigade); Ens. on Half pay 1752 (1st Battalion, Col. Marjoribank’s Regiment); Ens. Oct. 31, 1756 (1st Battalion, Col. Marjoribank’s Regiment); Capt. (42nd Regt.) July 24, 1757; Maj. Dec. 12, 1770; Lt. Col. Sept. 7, 1771; Aide de Camp to the King Feb. 19, 1779; Brevet Brig. Gen. June 15, 1779; Col. “in the Army” Aug. 19, 1779; Brevet Maj. Gen. July 27, 1781, Col. Feb. 13, 1782 (71st Regt. ), Maj. Gen. Nov. 26, 1782; Maj. Gen and Col. Jan. 13, 1790 (41st Regt. ); Lt. Gen. May 3, 1796; Gen. Jan. 1, 1801. Stewart and Victoria - I'd love to chat about the 42nd - how do I contact you. hi all- i am interested in what you have written. Paul - is your book out? Stuart - who is the subordinate you are writing about? have you all seen Ian McCulloch's 'Sons of the Mountains' vol. II - there is a bio. with photograph of Thomas Stirling. But the date for Stirling's wound is put at 1779 which is obviously wrong. There is also Peebles' American War ed. by Ira Grubner which is a contemporary account and he makes a number of references to Stirling. Thank you for such a informative piece. I do historical reenacting and we portray Captain Stirlings company. Our main events are at Fort Massac and Fort Dechartres. I would love to chat about what we do. Again I thank you for all the information. yes he did exist and was hard headed, i am currently working on a biography of one of his subordinates, and it is testfible that he was a hard nut to crack.